Thursday January 10th 1889 I helped a very little about the work this forenoon. Soon after dinner Will took me over to spend the afternoon with the girls. I knit in the evening after coming home. 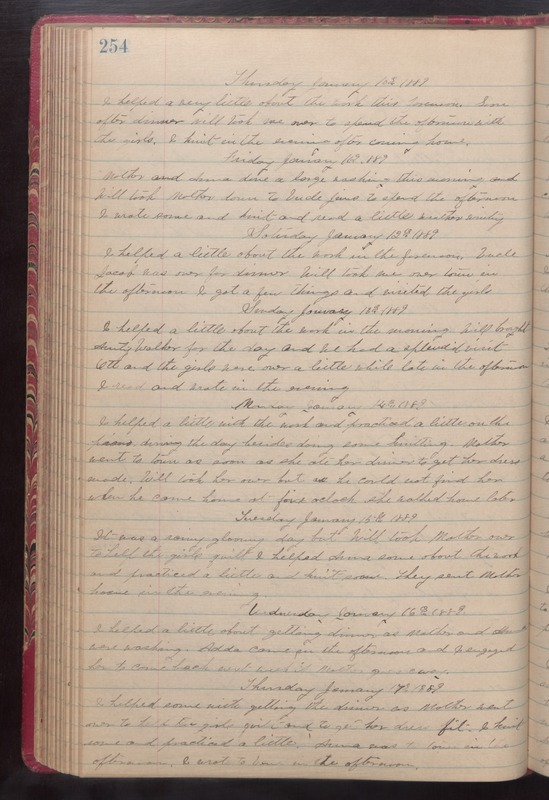 Friday January 11th 1889 Mother and Anna done a large washing this morning and Will took Mother down to Uncle Jims to spend the afternoon I wrote some and knit and read a little weather windy. Saturday January 12th 1889 I helped a little about the work in the forenoon. Uncle Jacob was over for dinner Will took me over town in the afternoon I got a few things and visited the girls. Sunday January 13th 1889 I helped a little about the work in the morning. Will brought Aunty Walker for the day and we had a splendid visit Ott and the girls were over a little while late in the afternoon I read and wrote in the evening Monday January 14th 1889 I helped a little with the work and practiced a little on the piano during the day besides doing some knitting. Mother went to town as soon as she ate her dinner to get her dress made. Will took her over but as he could not find her when he came home at four [five?] oclock she walked home later Tuesday January 15th 1889 It was a rainy gloomy day but Will took Mother over to help the girls quilt I helped Anna some about the work and practiced a little and knit some. They sent Mother home in the evening. Wednesday January 16th 1889 I helped a little about getting dinner as Mother and Anna were working. Adda come in the afternoon and I engaged her to come back next week if Mother goes away. Thursday January 17th 1889 I helped some with getting the dinner as Mother went over to help the girls quilt and to get her dress fit. I knit some and practiced a little. Anna was to town in the afternoon. I wrote to [Vene?] in the afternoon.